Last week, Paramount released the Star Trek: 10-Movie Stardate Collection on Blu-ray. The set comes with all six films starring the cast of the original series, as well as the four featuring the characters from The Next Generation. The films included here are Star Trek: The Motion Picture (1979), Star Trek II: The Wrath of Khan (1982), Star Trek III: The Search for Spock (1984), Star Trek IV: The Voyage Home (1986), Star Trek V: The Final Frontier (1989), Star Trek VI: The Undiscovered Country (1991), Star Trek: Generations (1994), Star Trek: First Contact (1996), Star Trek: Insurrection (1998), and Star Trek: Nemesis (2002). While the original series only ran for three seasons on NBC from 1966 to 1969, before it was cancelled due to poor ratings, the popularity that the show found in syndication in the 1970s led Paramount to greenlight a new TV series featuring the original cast. But the success of blockbusters like Close Encounters of the Third Kind and, of course, Star Wars in 1977 led the studio to adapt the pilot into a feature film instead, and that’s how Star Trek: The Motion Picture was born, spawning the cinematic franchise. Although it’s widely agreed that some of these films are better than others – The Wrath of Khan remains a genuine classic and The Voyage Home is a fan favourite, where as the William Shatner-directed The Final Frontier was a notorious flop with both critics and audiences alike – there is still a continuity to the series that makes it worth watching them in chronological order. The only films not included here are the three J.J. Abrams reboots, but otherwise this is a solid set for both serious and more casual fans of the series alike. The set also comes with two feature length bonus discs. First up is Star Trek: The Captains’ Summit, which features a special roundtable discussion with cast members William Shatner, Leonard Nimoy, Patrick Stewart, Jonathan Frakes and host Whoopi Goldberg, and next is Star Trek: Evolutions, which compiles a series of featurettes detailing different aspects of the series. This same 12-disc collection was originally released a few years back in cardboard packaging, and has been reissued now in a clear plastic case with a slipcover. My only real complaint is that the tabs holding the discs are quite stiff, making them extremely hard to get out. 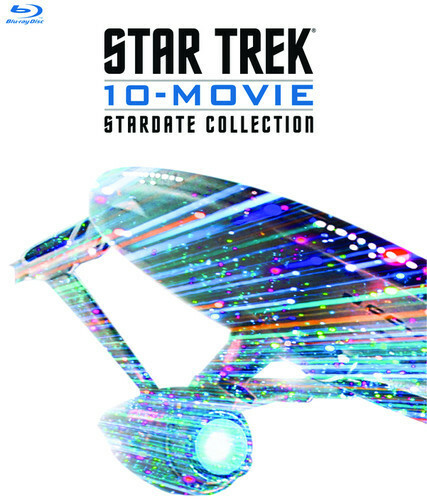 The Star Trek: 10-Movie Stardate Collection is a Paramount Home Media Distribution release.